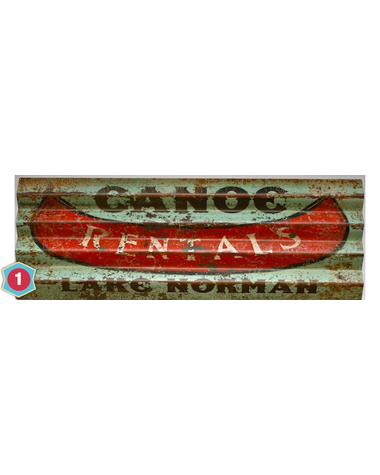 Add a vintage touch to your cabin or lake cottage with our Canoe Rentals Sign. It measures 17" x 44" and is manufactured with corrugated tin. Customize this charming decor for your lake! I bought this sign (in wood) last year for my boyfriend for Christmas. I personalized it with the name of the lake in Minnesota where he went camping every summer as a boy. He LOVED it! Also, I ordered it early because it said that during the Christmas rush, it might take a little longer to create and deliver. It didn't end up being a problem. The sign was created and delivered in the standard amount of time, even though the holiday season was coming up.